Count yourself lucky if you work from a home office but if you work in an open space corporate office, as I do, you literally go to work every day to face challenges with your air quality. A lot of open space cubicle-type office spaces rely on large commercial air-cons to provide workers with adequate indoor air quality but unfortunately, it's not enough to keep office pollution levels down. Even with air conditioning office space air is still contaminated by various air pollutants ranging from all kinds of chemical and organic odors to bacteria, dust, and allergens. Not to sound alarmist but these pollutants cause people to have unusual sinuses, headaches, and itchy or teary eyes as they work yet very few people can trace their discomforts back to the office’s unclean air. Most people think this its just their body acting up but as you read up on how poor air quality affects your body you start to become more conscious of your reactions to air. Now if you among the few who are aware of the dangers you know that the only way to get rid of these contaminants is to use an air purifier which most offices do not have. You could try to get your manager or boss to install one but it's so much easier to just get a desk air purifier for yourself. 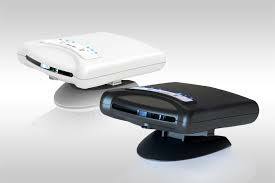 However, you are probably here because you wondering which desk air purifier would be best for you. Based on my thorough research I found on this only found 7 desktop air purifiers worth considering. These air purifiers stood out the most among many others which just had too many false and bad reviews and general complaints across the internet. A lot of other so-called office desktop air purifiers just didn’t have the kind of technology that would provide you with any noticeable improvements in your air quality. So you if decide to deviate from this list be very careful what you are getting yourself into. Even the 7th purifier on my list above was hard to make a call on as it quite a number of poor review but I gave it the benefit of the doubt due to the product manufacturer providing a warranty. Otherwise when it comes to desktop air purifiers, be on high alert and avoid and steer clear of products which do not have official websites and a warranty/guarantee from the manufacturer. That said let me give some basic factors to consider when looking for a desk purifier before I tell you why the above 7 desk purifiers are the best money can buy. When buying an office desk air purifier you need to keep in mind that environment you are working in. Let say you work in an open plan cubicle. The most obvious factor about your desk air purifier is that the device should not be a distraction for your colleagues when it is operating. This means you need to get a reasonably quite device. 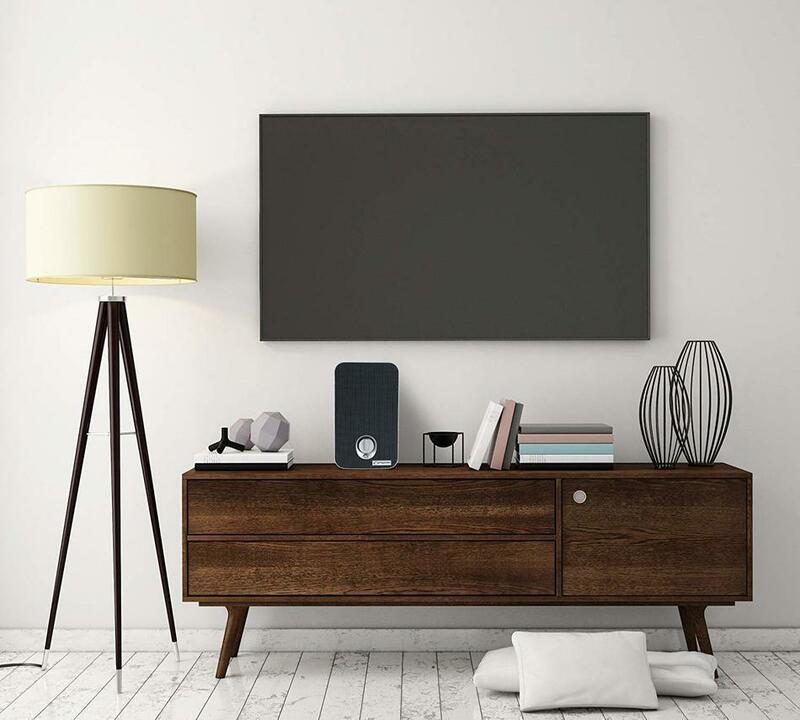 You also need to ensure your device does not emit any harmful by-products like ozone or leave a mess on surfaces as a result of its air purification process. 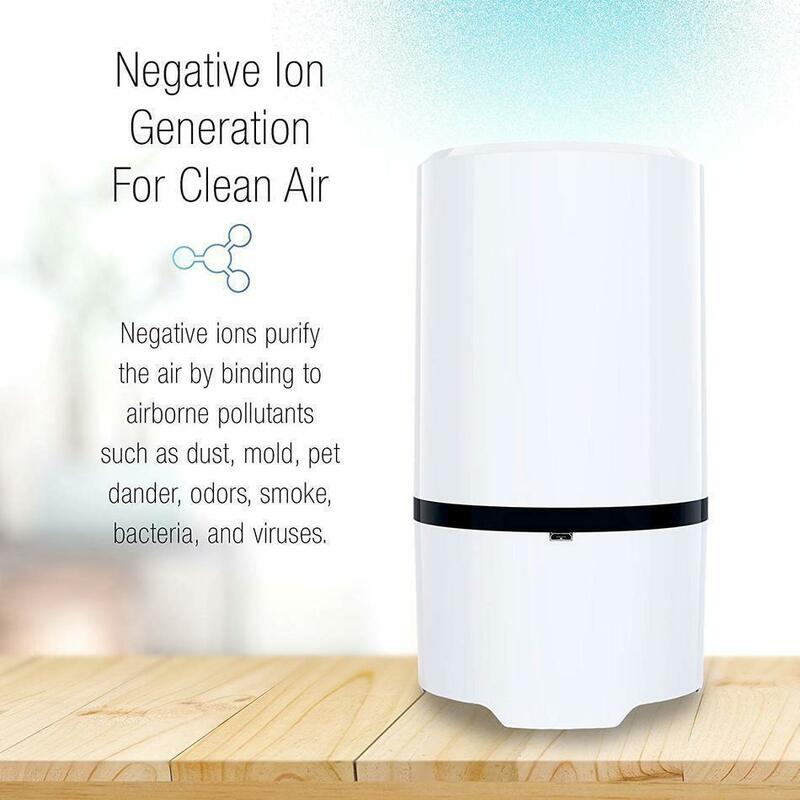 Just from this description, you can eliminate ionic air purifiers and ozone air purifiers from your list of potential desk air purifiers. Next because this device will be based at your workplace you have to go for a device that needs minimal maintenance such as filter changes as you do not want to be racing up and down changing filters in the middle of your workday. Your device should also be as small as possible not to take up too much space on your desk but at the same time without losing its effectiveness in purifying your air. I personally also like devices that can be charged using a USB charger and that can run on both battery and the main power supply. To minimize the time I spend fiddling with my desk purifier, I aim to get a device that has automated functions that allow it to adjust its air cleaning speed synonymous with the air quality changes around my cubicle. I also want a device I can schedule to turn on and off as need arises and a device that warns me when it requires maintenance. A bonus will be a device that can interact with my phone or laptop. Also, the best office desk air purifiers can cover and clean an area of at least 50 sq ft which is more enough to cover your cubicle given you are in large open space. Lastly, your device should be able to deal with all kinds of air pollutants ranging from smells to large particulate matter like dust. This limits my range on the type of desktop air purifiers to either a true-HEPA air purifier with an activated carbon filter or a Photo Catalytic Oxidation (PCO) air purifier. However, I have left some leeway on my best 7 list and allowed for HEPA purifiers without activated carbon. This means you have to make alternatives like buying bamboo charcoal air purifying bags to deal with odors, gases and Volatile Organic Compounds which HEPA filters cannot address. With these criteria in mind, let's see how they play out in our list of 7 best air purifiers. IQAir’s new and innovative Atem is the only personal air purifier to provide unique HyperHEPA filtration. This is possibly the most effective HEPA air filtration available. Placed on your desk, the Atem can deliver a stream of up to 99% purified air to the breathing area around your desk. Area of HEPA Media - 32.3 sq. ft. The main challenge with the Atem is that it does not deal with odors and gases effectively as it has no activated carbon filter. Regardless, it meets most of the criteria I specified above and I would go for this if VOCs and odor are not a major problem causing me discomfort in my office space. Next on the list is the Amaircare Roomaid Mini. This is an outright HEPA activated carbon combo air purifier. It is small and will fit easily on your office desk with dimensions of 8.5" (round) x 6.125" (height). 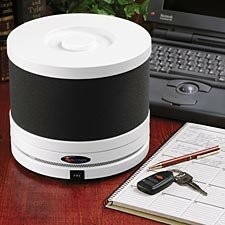 The Amaircare provides up to whopping 250 sq ft in coverage for a desk air purifier. It removes large particles such as vehicle emissions, pollen, dust mite, carcasses & feces, pet dander, cigarette smoke, and candle char, bacteria, viruses, mold spores and allergy and diseases causing fungi from the air. Its carbon filter captures VOCs, gases, and odors.Your carbon filter will and pre-filter will last you about 12 months and your HEPA filter up to 2 years. You also get a 5-year limited warranty on your air purifier. The only thing that Amaircare does not have is smart functions. But that said this device gets its job done besides having to operate it manually. The Wynd Air Purifier taps particulates such as pollen, pet dander, bacteria and industrial pollution particulates from sources such as traffic, factories, and power plants but is unfortunately not so effective for VOCs and gases. 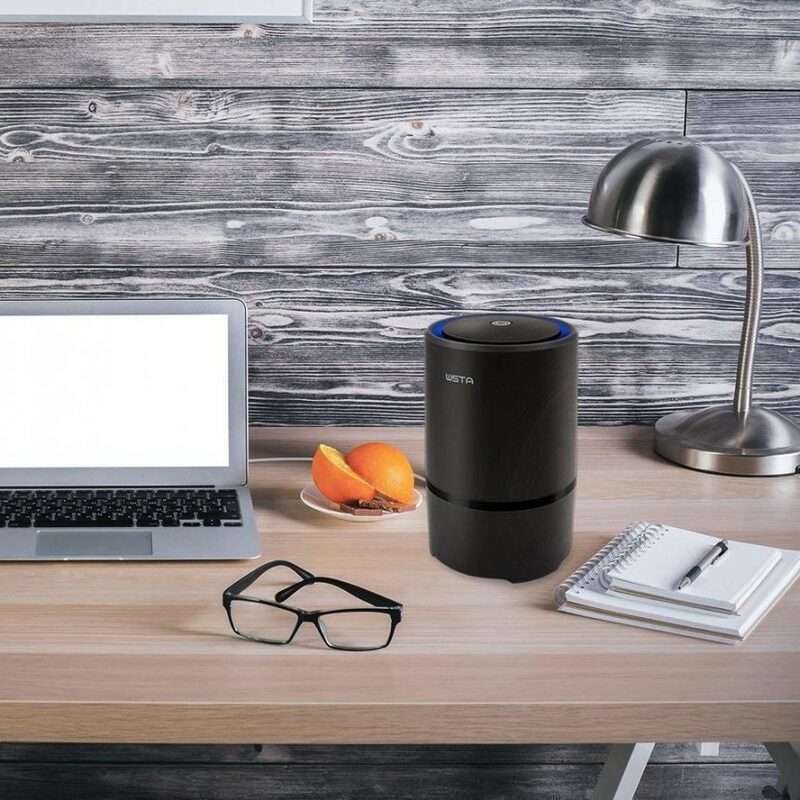 The Wynd air purifier is good enough to use as an office desk air purifier and will provide you with much needed clean air but you have to use it in conjunction with an external odor eliminating solution like activated charcoal air purifier bags. In addition to a HEPA and an activated carbon filter, the Germ Guardian air purifier also comes with an ultraviolet light compartment that kills airborne mold spores, germs, viruses, and bacteria. It is designed to fit well on tabletops and desks and any small space and provides sufficient coverage to give you clean air around your desk. The Germ Guardian provides very silent operation and with the exception of the UVC compartment its filters need to be changed every 6-8 months but the device does warn you once a filter needs changing. The Germ Guardian desktop purifier comes with a 1 limited warranty. The only thing missing with the Germ Guardian desktop air purifier is additional smart features beyond filter change warnings. The Air Angel is one of the few if not the only proper PCO desk air purifier you are going to find on the market. It uses Nano AHPCO (advanced hydrated photo catalytic oxidation) technology, germicidal UV light, washable stainless steel filter, and an Ion generator. It’s a very low maintenance device and can go a year without being maintained. The Air Angel removes up to 99% odors, destroys up to 99% germs, and eliminates up to 99% air allergens. It also covers a whopping room size of 250 sq ft and provides the most silent operation compared to other types of desk air purifier technologies. The Air Angel, however, falls short when it comes to smart features. I just did not see any for such a powerful device. 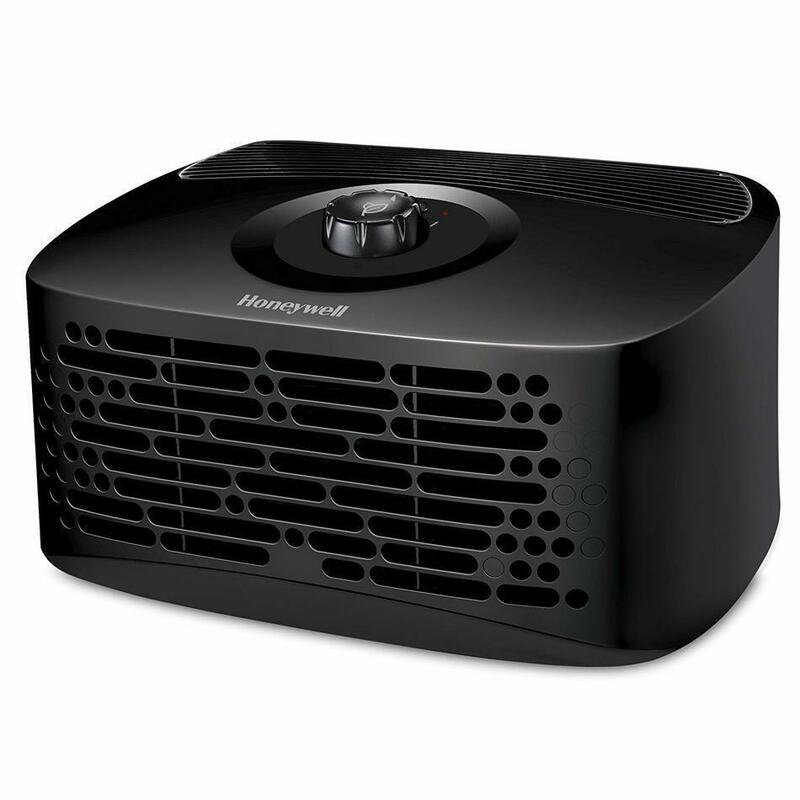 The Honeywell Tabletop purifier is yet another activated carbon HEPA Air Purifier. 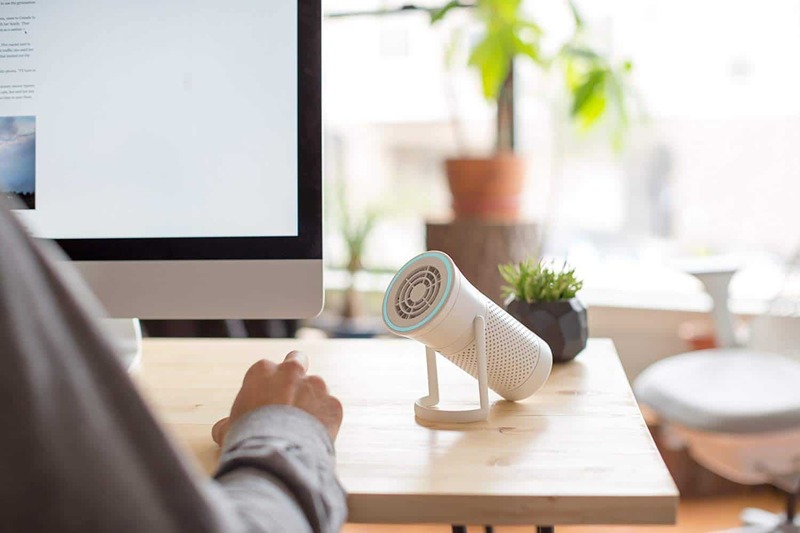 It can capture up to 99.9% of microscopic allergens of 0.3 microns and bigger from the air that passes through its filter. It also has a filter replacement indicator and it can clean a space of up to 80 sq ft.
Its pre-filter replacement is however quite high maintenance with filter changes needed at least every 3 months for it to perform optimally. Its HEPA filter however only needs to be changed once a year. Like most of the desktop purifiers, the Honeywell Tabletop purifier is also lacking in terms of smart features. Lastly, we have the NEt-Dyn air purifier. It was really a stretch putting this device on my list but it made it. It is combo HEPA-type and Ionic air purifier. It gets rid of both large particulate matter and also gases and odors using its negative ion function. The Net-Dyn, unfortunately, does not have any smart features. I also hate that its light stays on all the time when it is on. However, it does come with a USB ready charging port and it can work on battery power. I would only suggest using this air purifier if you do not have respiratory issues as it emits small ozone quantities. After going through various reviews, the conclusion I keep drawing is that the Net-Dyn air purifier works and improves air quality. It is however not a high-quality device. It offers poor functionality and I would only go for it if I was on a low budget. The only other thing I can say here is that you should not waste your time on any other desktop air purifiers that have worse features and reviews than the Net-Dyn. Based on my research the Net-Dyn air purifier is the worst of the best. Its, manufacturers just don't make great desk air purifiers. They are such a rare find. 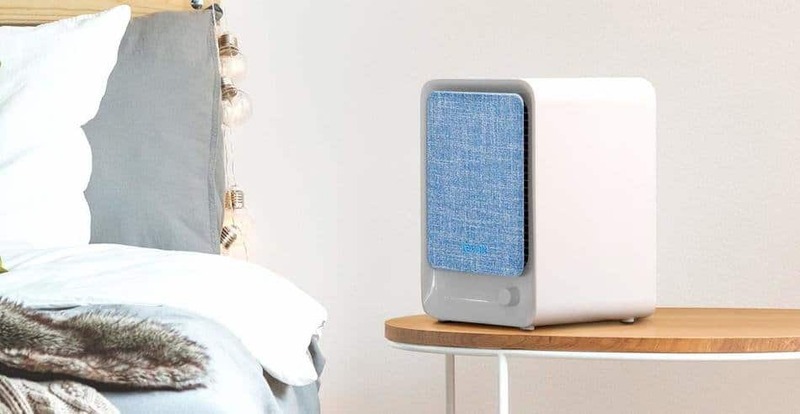 Now that we have looked at some of the best desktop air purifiers the market has to offer online, if I was to pick one among the purifiers we have reviewed, I would go with the Air Oasis Air Angel because of its sheer ability to get rid of contaminants in the air and also its coverage. From a smart device perspective, I would then go with IQAir Atem. I would then have a hard choice between the Germ Guardian, Honeywell and Amaircare devices but I think I would eventually settle on Amaircare. For the remaining devices, I would stick to WYnd and Net-Dyn would be my last resort. That's pretty much my list of best office desk air purifiers, but pleases be aware that as technologies improve and the world evolves, this list will eventually become obsolete. 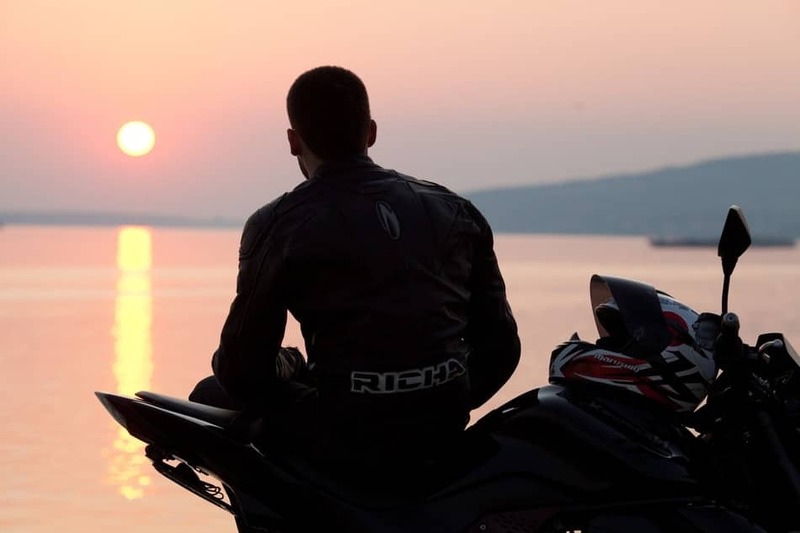 Should you find yourself reading this and things have changed, you need to go back to the drawing board with the selection criteria but I do not think it will change much. The underlying selection principles will remain the same. 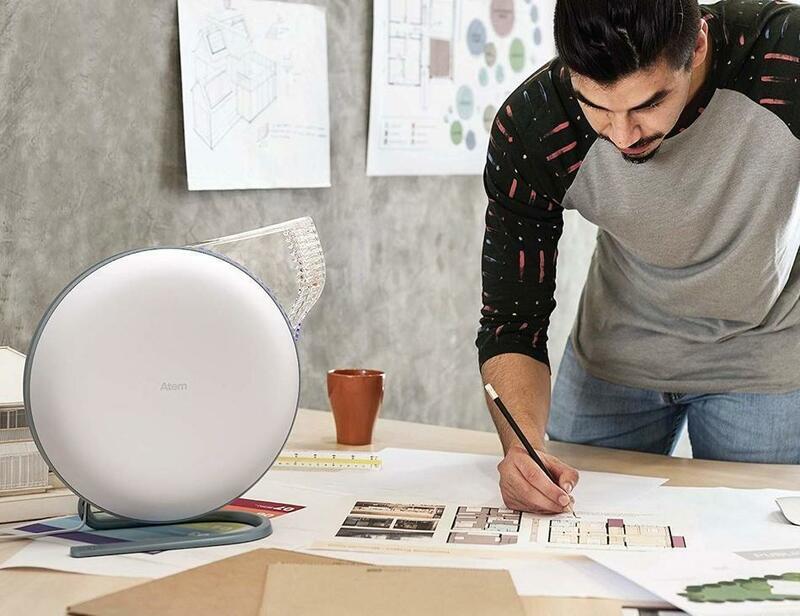 When choosing an office desk air purifier in an open plan office, find a connected and smart air purifier that not only removes the widest range of air contaminants in your air but also covers a room size of over 50 sq ft.
You also want a device that does not disrupt your workflow or the workflow of your work colleagues. Stick to these principles and you should always be able to find the best office desk air purifier money can buy even when technology advances. If want to know which tabletop air purifier to go for, click here to check out my specific recommendations on which table top air purifiers.